If you’re anything like the majority of Americans, your New Year’s resolutions are probably already fading into the background. Lose weight? Get lost! Drink less? Who’s watching? It’s not that you’re resolve is weak, per se. It’s that resolutions like that are no fun at all. But skiing is fun. And learning to ski is the fast track to fun. January is Learn to Ski Month, and to us here in Breck, that sounds like just the kind of resolution we’re looking for. Whether you’ve never been on two planks or you just want to take it to the next level, lessons are a sure-fire way to hone technique, build strength, and gain confidence. Plus—riding with an instructor is a guaranteed way to cut the lift line. Ultimate Four: Grab three buds and get a screaming deal on a group lesson. With a teacher:student ratio of 1:4, you’re guaranteed to get personalized feedback both on and off the slopes. The lesson package includes lunch. This is open to kids and adults, so an entire family could do it together. Prices start at $256/group; a multi-day discount is available. First Time Discovery Series: If one is good, three is better. Three days, that is. This three-day intro to skiing includes three days of lessons, lift tickets, and rentals all for $310. Specialty Camps: Whether you want to rip the steeps like a pro, hit the half pipe, learn with an all-women’s group, or enroll your grommets in the wildly successful Breckenridge Bombers, there’s a specialty camp for you. Click here to learn more. Want to know a little secret about learning to ski? It can be hard. It can be really frustrating. It can feel completely unlike skiing. All the energy that goes into mastering the technique is a lot for the brain and body to handle. There is falling involved. And cold and snow and ice. But if you stick with it and push through the rough spots, it gets easier and easier until one day you realize you carved your turns from the top of the run to the bottom and you didn’t even have to think about what you were doing! That’s the day where you go from feeling like someone learning to ski or snowboard to, simply, beautifully, a skier or snowboarder. 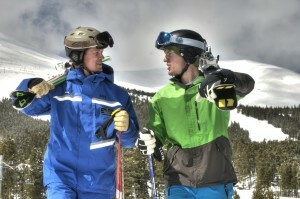 January is Learn to Ski Month at Breckenridge – Colorado Snow linked to this.